My revival of the '79 is almost complete, just have to rig of the auxilliary power for devices that werent invented back then; cigarette lighter for my Garmin and USB charger for phones and such. Add in the newly recovered seat and I will be done! 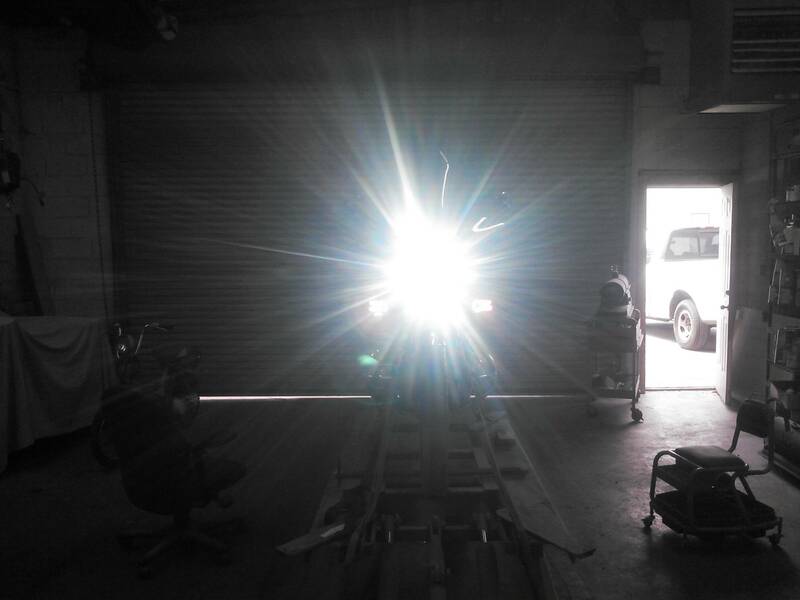 Having put a modern LED light on the DRZ400 dual sport machine, I knew there was room for improvement. The light is plug and play, unless you want to use the halo and turn signal function. For turn signal function, the white halo light chnges to yellow and blinks evidently. I skipped that. Turns out that effect would be very hard to see! 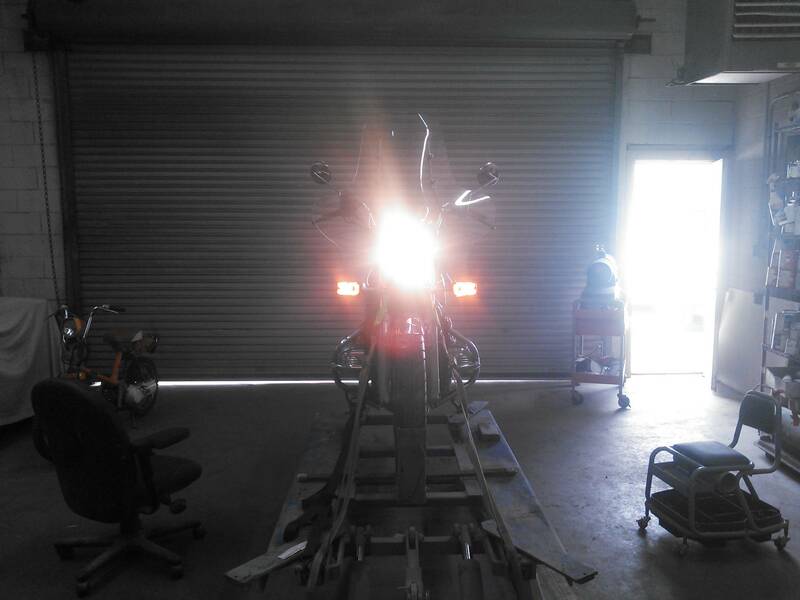 Like it so far in the shop, cant wait for a night ride to see what it really does! OnaWingAndaPrayer and DaveO430 like this. Added power and USB ports to the tool tray. Cycle Gear items. 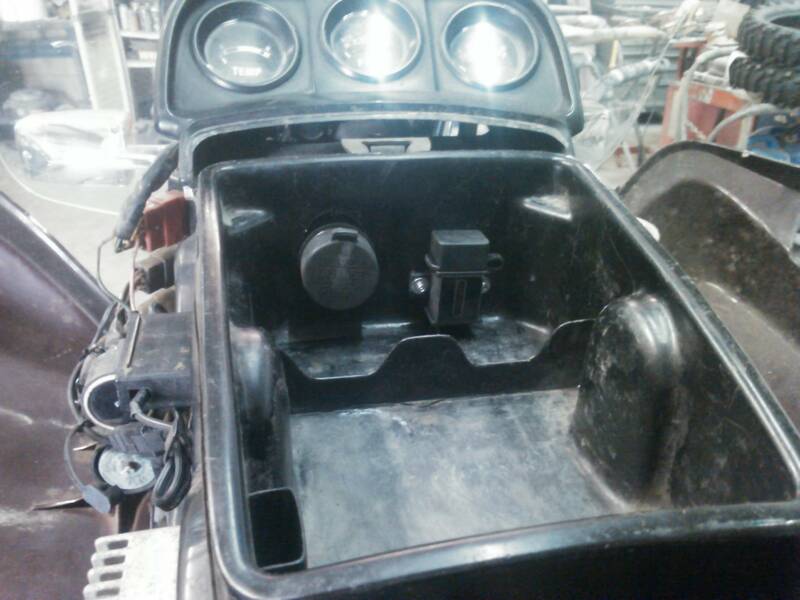 The cigarette lighter port is intended to be bar mounted, but the bar mount can easily be removed and panel mounted. 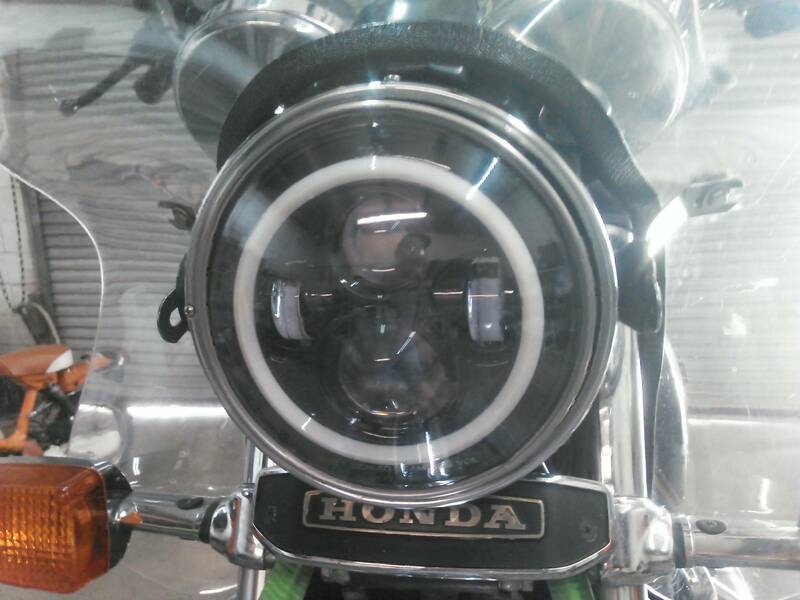 That's one bright headlight, it should work very well at night. And make it more noticeable in the daylight, which is what I need more than night vision since I haven't ridden after dark in a long time. Yup. That's what you want. A way to blind all the traffic around you. Once I get it off the lift and the suspension under my load, I will take a few minutes to aim. I think that is a lot more than the cagers do when they mount obnoxious lights. The photo was taken for maximum effect. There is a distinct cut-off line in the beam pattern. That's the thing, most people that put in aftermarket lights don't bother to adjust them. Even 6 volt incandescent headlights would blind oncoming traffic if not aimed right. And Dennis, I want to be seen, I don't care if it bothers someone. I was tootin' across a Nevada back road one evening and coming the other way was a GL18. He appeared to have his brights on and it was getting to the point that I couldn't see anything but those lights. I had flicked him a couple times and finally just turned the bright on and left it. He flicked his brights at me! As he went by I figured out what bike is was. He had a passenger and trailer and hadn't compensated apparently. That was with stock halogens. And not that long ago, in town, a lifted pickup blinded me and I hit a German Shepard. Killed the dog and did some damage to the bike. I don't think it's a good idea to have other drivers blinded by anybody's lights. I know there are laws, but they're not enforced. It is probably just as dangerous for you to blind other vehicles as it is to risk them not seeing you. Maybe more so as it's multiples instead of one offender. Decent lighting, well aimed and proper lane positioning should get you home safely. I will be sure to take a picture of the clear horizontal cut-off line. The high beam draws the same kind of line, only a bit higher. I am the first to raise hell at badly aimed aftermarket lights. I wont be part of that problem. But I wont wander around with yesteryear's lighting just because others cant be bothered to aim modern lights. Bike...and Dennis and limpy45 like this.